I can report that while it looks like sludge left over from a secret experiment gone wrong, when eaten properly it is quite tasty. Vegemite is a concentrated yeast extract. I know, that really doesn’t make it sound any more appetizing, but it’s true. It’s made from the yeast that remains after the beer brewing process. Since Australians are unlikely to stop drinking beer any time soon, that means it’s quite sustainable and a good re-use of something that would otherwise be thrown away. Vegemite is also one of the richest sources of B vitamins in the world. Oh yes, we’re piling up those exciting reasons to try out yeast spread on your toast aren’t we? Well, here’s something that should tantalize food lovers everywhere. Vegemite has a very high concentration of glutamic acid. So what, you say? Glutamic acid is what we taste when we experience umami or the “fifth taste” after salty, sweet, sour, and bitter. Umami’s prized, savory flavor is found naturally in many foods including Roquefort cheese, Parmesan cheese, soy sauce, grape juice, tomatoes, human milk, and beef. Vegemite nearly tops the list however, with over 1400 mg of glutamate per 100 grams; it is literally yummy. As is customary around here, let’s have a brief look at the history of Australia’s favorite sandwich spread. Vegemite was invented in 1922 by, Dr. Cyril P. Callister, a chemist at the Fred Walker Company. The name was chosen in a nation-wide contest which was judged by Mr. Walker’s daughter Sheila. The winner, whose name has been lost in the mists of time, received a prize of ₤50 (about $2600 US today). The new product debuted 1923. It was not a hit. The next chapter in the history of Vegemite gives some insight into the Australian sense of humor. In 1928, after lackluster sales, Mr. Walker tried renaming the product Parwill. Australians were familiar with a similar yeast extract made in the UK called Marmite, so Walker created the tag line, “If Marmite . . . then Parwill” (try saying it with an Aussie accent). Whenever I groan at one of my Australian husband’s pun-filled jokes, he reminds me that it just might be genetic. Walker first tried selling Parwill in the state of Queensland as a test. It did about as well as you might expect . . . terribly. So the name was changed back. In the end, Vegemite’s reputation was rescued by science. Just before WWII, the British Medical Association gave Vegemite its official endorsement as a product to be recommended by doctors to their patients as a source of B vitamins. During the war there was actually a shortage because the Australian military was buying every jar they could get their hands on to boost the nutrition of their soldiers. As often happens, when people can’t get something, they want it more, and the fact that it was helping their soldiers fight the good fight was great free marketing. Spread the hot toast with a good amount of soft, unsalted butter and allow it to melt nicely. Dip the tip of a clean knife into a jar of Vegemite and make a squiggle of it across your buttered toast. Do not, I repeat DO NOT, put more than this amount of Vegemite on your toast the first time you try it. 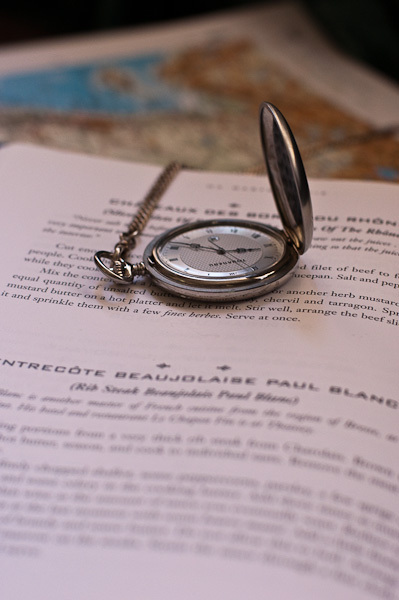 Later, you may want to experiment with more, but start with just a tiny bit. Some Australians enjoy horrifying visitors to their country by telling them they should just eat Vegemite from the jar with a spoon. For shame! Don’t believe anything they say about drop bears either. It’s a great addition to sauces and soups to give that savory umami taste. Some pregnant women swear by it as a cure for morning sickness. Oh, and it contains a ridiculous amount of folic acid which is essential for women of child bearing age. Mix with water and use as a marinate for chicken. Add a little to your meatballs or meatloaf. 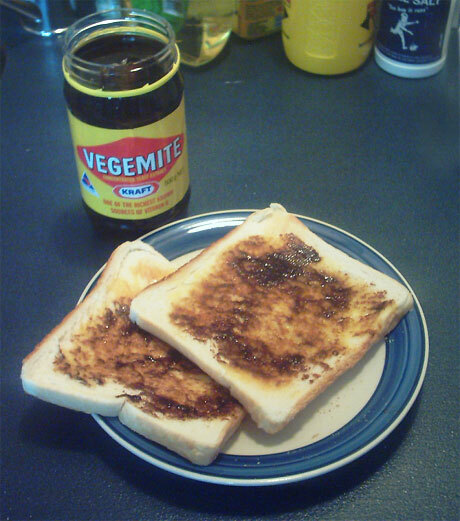 Vegemite is supposedly a great hangover cure (the Aussies should know!) and hey, the vitamins certainly won’t hurt. Ideas quick-march into motion like battalions of a grand army to its legendary fighting ground, and the battle rages. Memories charge in, bright flags on high; the cavalry of metaphor deploys with a magnificent gallop; the artillery of logic rushes up with clattering wagons and cartridges; on imagination’s orders, sharpshooters sight and fire; forms and shapes and characters rear up; the paper is spread with ink — for the nightly labor begins and ends with torrents of this black water, as a battle opens and concludes with black powder. The Oromo ethnic group of Ethiopia are thought to be among the first humans to consume coffee. However, they did so in a very different way than we do now. In nature, the coffee tree produces a reddish-purple fruit called a coffee cherry or berry. At its center is found a seed. Modern processing strips away the fruit and then ferments and roasts the remaining seed, which becomes the coffee beans you buy at your local shop. The Oromo people simply ground the ripe cherries along with their seeds in a stone mortar and then combined the resulting paste with animal fat — perhaps butter as they were nomadic pastoralists — which they then rolled into balls for convenient transport. Fresh coffee cherries are full of caffeine, sugar, and fat, and are about 15% protein. Combined with animal fat, they really make the perfect portable energy food. This form of coffee consumption was observed as late as the 18th Century by British explorers who described billiard ball-sized morsels which were stored in leather bags and eaten for extra energy by warriors on raids. Study of the oral history of the Oromo people shows that this use of coffee is likely quite ancient. There is also evidence of other usage of coffee by the peoples of Northeastern Africa. Some cooked the ripe berries into a porridge, others made wine from the fruit and skin. The Shadhiliyya order of Sufis was instrumental in spreading coffee throughout the Islamic world during the 13th through 15th Centuries. 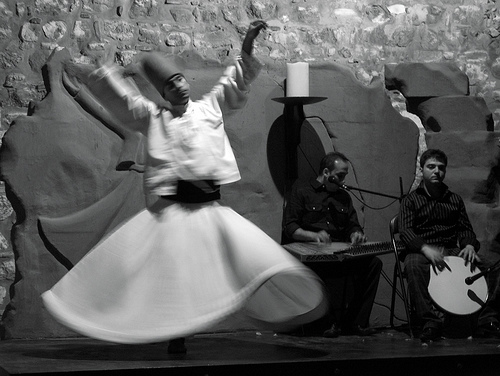 Their dervishes (whose whirling I imagine was fueled all the better by coffee) were lay people and and once they were introduced to this magical brew in a religious setting, they brought it into the secular community. Once coffee was brought to the Arabian peninsula from Africa, two distinct beverages were made from it. 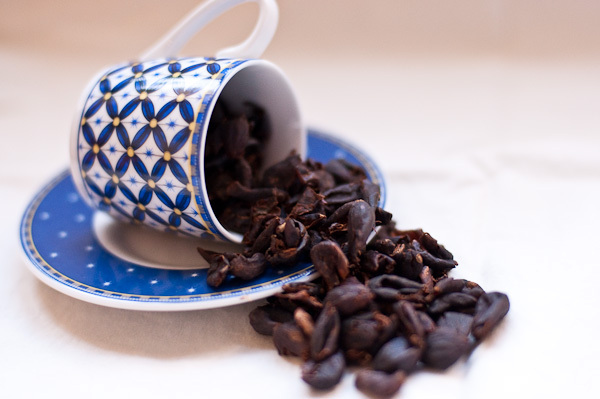 The first, known as quishir was actually a tea made by steeping dried coffee cherries and their husks in boiling water. Coffee is still drunk this way in Northeastern Africa and Yemen today. The second preparation was called bounya which comes from the word bunn, Ethiopian for the “seed” or “bean” of the coffee tree. Bounya was a thick drink made from raw, crushed beans, the residue of which was consumed also, leaving nothing in the bottom of the cup. There is an argument as to whether the roasting of beans began in Persia or Saudi Arabia; where ever it happened, it was the next step towards coffee as we know it today. 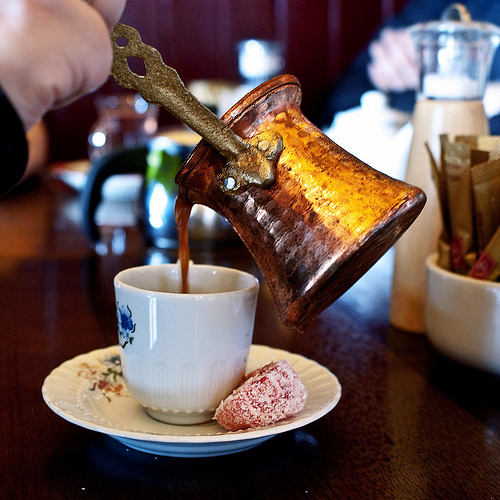 In the 16th Century, Islamic coffee fanatics invented the ibrik, a small coffee pot in which they boiled their favorite brew. Finally, in the 18th Century, people began to infuse the roasted, ground beans the way we do today. However, in some parts of the world, like Turkey and Greece, boiling is still the preferred method of preparation. Unless you know someone with a coffee tree, it is very difficult to get fresh, ripe coffee cherries in the US. If I ever get my hands on some, I’m going to try making coffee power bars by grinding them up and mixing them with butter. Happily, I did succeed in finding dried coffee cherries and their husks which can be made into quishir. The folks at Counter Culture Coffee sell a product called Cascara which is the dried fruit and husks of the coffee tree and is meant to be drunk as a tea. The word “cascara” is Spanish for “husk,” so named because the coffee that goes into it is grown in El Salvador where they don’t have a tradition of making tea out of dried coffee fruit. The result is an interesting hybrid. It smells somewhat like coffee, but fruitier. It has the slight bitterness of coffee, but the body is more like tea, not as thick in the mouth as coffee. The initial flavor is similar to coffee but then there is a bloom of fruits: currents, raisins and surprisingly, a touch of lemon and orange, perhaps this is the coffee’s natural acidity? It is almost like a black tea that has been flavored with a fruit essence, the way Earl Grey is flavored with bergamot. However, the quishir is smoother with none of black tea’s harsh tannins. It definitely has more caffeine that black tea, I felt quite perky after drinking it, perhaps even able to last through an all-night prayer session. The coffee fruit and husks are more delicate than beans, so it is important that you not use fully boiling water. Allow the water to cool to 190-200F before pouring it over the coffee. If you don’t mind lumpy bits in the bottom of your cup as you drink you can just put the quishir/cascara in your mug and then pour the hot water over it. Or if you prefer, put it in a measuring cup and when it’s done steeping, strain it into a mug. Steep for 5-7 minutes and serve. Try it alone first and then if you like, add some sugar to bring out the fruity flavors. Seidel, Kathleen. Serving The Guest: Food For Remembrance.